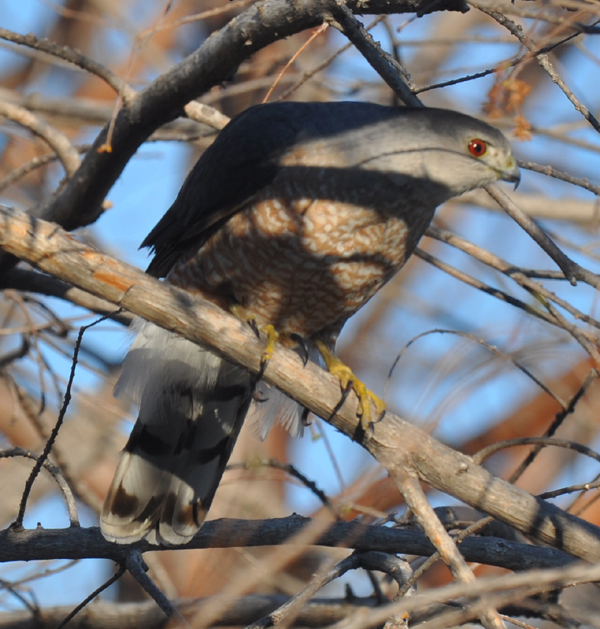 In many areas, the Cooper's hawk is "coming to the city ..."
The Cooper’s hawk is known by many names: “blue darter,” “lynx of the bird world,” “flying cross.” Some even call him a “chicken hawk.” After all, he is an accipiter, a raptor that eats other birds. There are only three species of the genus Accipiter in North America: the sharp-shinned hawk (A. striatus), the Cooper’s hawk (A. cooperii), and the northern goshawk (A. gentilis). The sharp-shinned, or “sharpie,” is the smallest, about the size of a blue jay. The Cooper’s hawk is larger, about crow size. And the northern goshawk is the largest of the North American accipiters. All three species are characterized by very long tails; relatively short, rounded wings; and a decided preference for avian prey. Accipiters prefer a habitat populated by trees, where they have the greatest success hunting and capturing their prey. Recent observations suggest that the traditionally woodland Cooper’s hawk is adapting quite well to a changing environment. 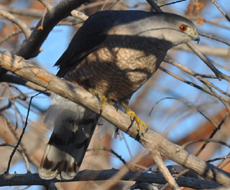 In many areas, the Cooper’s hawk is “coming to the city,” where tree-lined urban greenbelts, parks, and bird feeders provide a productive habitat.